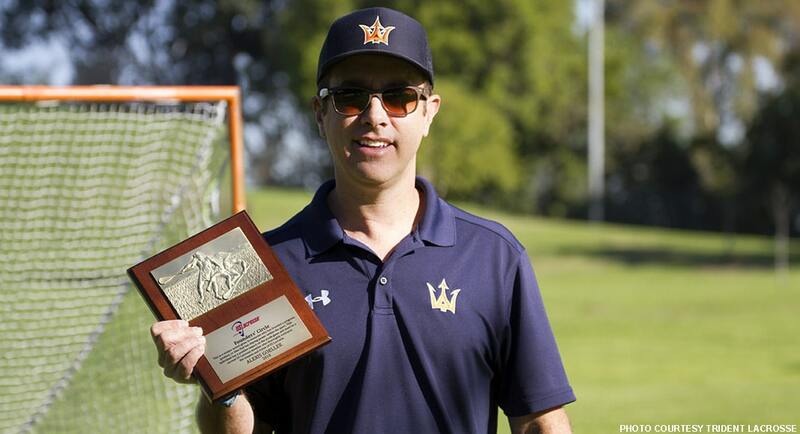 Alexis Goeller, director of Trident Lacrosse, recently received the US Lacrosse Founder’s Circle Award for 2018. The award is given to someone who has founded a program, had a positive impact on youth lacrosse and who thoroughly embraces the mission and values of US Lacrosse. Goeller had 10-plus years invested in the youth game with clubs in the LA area before starting Trident Lacrosse for both boys and girls in the South Bay. He expressed his gratitude to all those who made this honor possible and credited Trident’s success to genuinely caring about the needs of his young athletes. “At Trident Lacrosse, we have always let the needs of our youth athletes guide our process,” Alexis Goeller said in an email to MaxLax. “Our ‘athlete first’ approach has resulted in a focus on improving our players through training and building the skill set that is appropriate for their age and preparing them for the next level. We have made every effort to keep our roster sizes manageable, so that every athlete gets the attention and instruction they need to grow and learn the game, and we have always been willing to provide any resources needed to grow the game and enrich the experience of our players in a fun and positive learning environment. “The US Lacrosse Founders’ Circle Award is a testament to those within the Trident organization who work tirelessly to uphold this vision and to foster the ideals of individual growth and a love for the game. Trident Lacrosse offers programs year-round for boys and girls, grades K-8.